Nearly every title of a Steve Hanks painting has more than one meaning. Each has an obvious tie to the image you see and then there is the message he intends the painting to send. 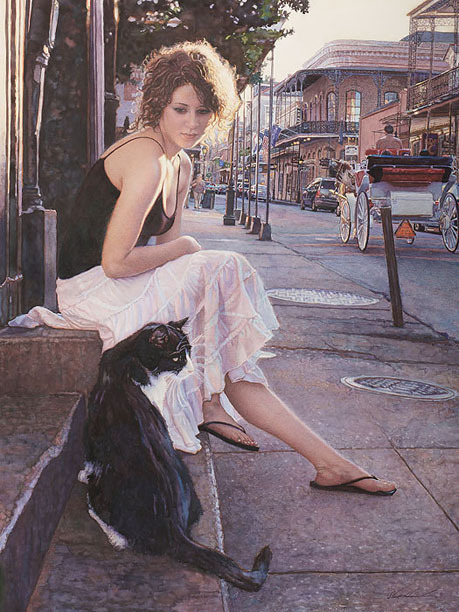 On the surface, Companions of the Big Easy shows a woman and a cat on a street in New Orleans and their relationship is easily understood. But this is a Steve Hank’s painting, so there is always more. It’s renowned as an easy-going, friendly way of life is at the heart of this big city’s moniker. But New Orleans is a big city and big cities can be complicated and unfamiliar places – a good allegory for how life can feel at times. The street is not teeming with people enjoying what the city has to offer and is covered in shadow, a somewhat lonely place. The cat is a stray. There is no collar and the girl’s reaction is one of compassion, not familiarity. Perhaps she too is a stray. Though the cat looks away, it has approached her and a window of opportunity between the two has been opened. What will happen?